It’s no secret that The Lemon Hive loves handmade, hand crafted and hand designed products, especially greetings cards! I’m a massive supported of small business owners and try to buy from local and small entrepreneurs whenever my budget allows. I interviewed Myroslava of Myro Doodles. 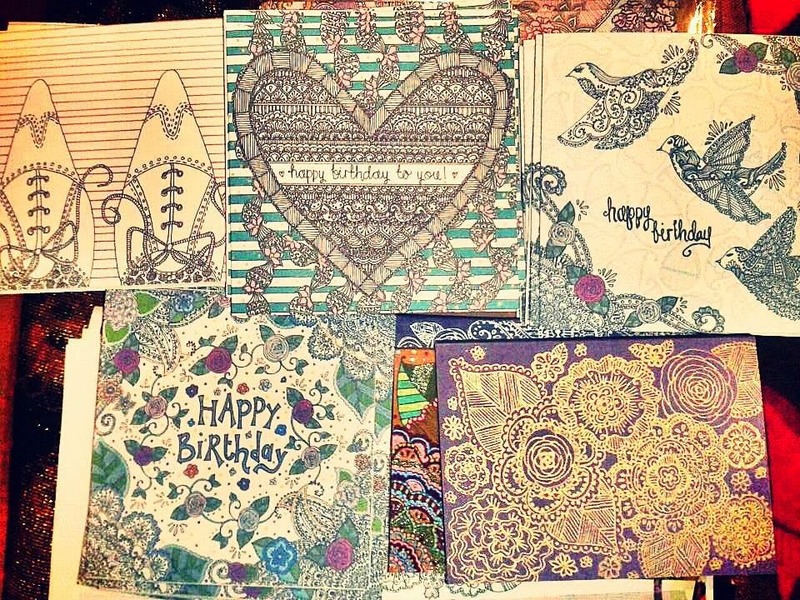 She has a wonderful Etsy shop where she sells her hand drawn cards and notebooks. I was so delighted when she agreed to the interview because, although Myro is not local, she lives in Manchester, England. Manchester is close to my heart and having lived there for 3 years, I feel connected with the place and the people long after leaving. Thankfully, the internet and Myro‘s awesome business plan means that I don’t have to be local to enjoy her brilliant goods as she ships internationally. I’ve admired Myro‘s style for about a year now, following her closely on Facebook. She is such a force of positive energy, so much so that she successfully set up a Facebook page, The Bright Side, promoting inspirational and positive thought. It’s a brilliant pick me up for grumpy days. Myro, thank you so much for chatting with me today. I love your products and style and I’m eagerly awaiting your new Christmas line. But for those who aren’t familiar with your work, could you describe it in one word? Detailed! From my drawings to the way I pack my orders for customers, I like to think the little details are what makes Myro Doodles special. Tell me a little bit about what you do and why you do it? I create hand-drawn illustrations inspired by mendhi designs, Ukrainian culture and the randomness of my imagination – I use these for greetings cards, notebook covers and glassware amongst other things. I’ve always been a doodler and there are few household objects and paper surfaces that have escaped me and my pen before! Even when I am sat watching the TV, I’m drawing, and Myro Doodles enables me to share my ideas and imagination with more than just the pages of my notebooks. How did you start creating your cards and when did you know the time was right to sell them? I started Myro Doodles just before Christmas time which is the one time in the year when everyone needs cards! I was lucky to be offered a stall at a craft fair (which can be hard when you’re not yet established) and even luckier that they proved to be a hit – the momentum from that first Christmas was vital in building my business and I am pleased to say that almost a year on we have made great leaps from those first doodles! You’ve been selling Myro Doodle cards for just over a year now! Happy Birthday! That first year is hard, especially without heaps of contacts. How did you go about networking and building a name for yourself? Social media has been a godsend! Because my main source of networking is the internet, maintaining my Twitter and Facebook accounts is a big priority for me – I try to post every day, and even if I have no work to show I like to share things that I find interesting and inspiring myself, be it a link to a business I admire or a picture of a micro pig! The personal touch is central to my brand so I endeavour to show my personality through my posts and to connect with my customers as much as I can. I think social media is a seriously useful tool when starting a new business – I managed to get involved with my first official event through tweeting local event planners, and it can be fiendishly difficult to get involved with the craft fair circuit if you’re only just starting out so I have a lot to thank Twitter for! Networking and building a name for yourself is pretty hard work. There are only so many hours in a day! You have a house, a full time job, a partner, family and friends and a small business, how do you manage to balance it all and keep your sanity? Myro Doodles gives me a chance every day to do what I absolutely love, and if you are passionate about something it doesn’t feel like work. Managing and maintaining my business is something that slots into the breaks in my life – I update my social media during my commute in the mornings, I finish orders when I am watching TV in the evening, I come up with new ideas when I am cooking dinner…I hope there’s a time in the future when Myro Doodles will be the main focus of my attention, but for now my multi-tasking skills are ever improving! You always come across as someone who tries hard to see the positive in everything around them, even going as far as creating a Facebook page to promote optimism. Life isn’t always peaches and cream, so how do you handle naysayers and negativity? I am the kind of person who puts my heart and soul into everything I do, so it has been a learning to curve to not burst into tears every time someone criticises my work! As the saying goes, ‘You can be the ripest, juiciest peach in the world and there will still be someone who doesn’t like peaches’ – I have learnt that my work is not everyone’s cup of tea, but that it is more important to care about the opinions of the ten people who love your work than the negativity of one person who doesn’t. It is easy to give up when starting a small business, especially a creative one – how do you know your work is good enough? How do you get anywhere without knowing a thing about business? How the heck are you going to succeed in a climate where established businesses are struggling? If you love what you do and you believe in what you do, that should be enough to drown out those voices. Keep strong, but never stop putting your heart and soul into your work. You have lots of responsibilities, you work hard at staying positive and being a small business owner. What are the three things that keep you sane? Is gin a bad answer?! Although gin is a well-loved friend to Myro Doodles, the first would have to be my supportive friends and family who have been behind me since I had the crazy idea to start this whole adventure – the ups are sweeter and the downs are easier to bear with them around. The second would be every single kind word and good review I have received – knowing people appreciate and enjoy what I do is a real buzz and helps me to keep creating things that are bigger and better than before. And finally, the love of doodling itself! I have loved to draw since I could hold a pen,and even if no-one bought a thing I would still find joy every time the ink touches the paper…and that’s what keeps me going. Finally, what would your advice be to anyone wanting to follow in your steps and sell hand drawn or home made items on Etsy? I love Etsy and I would encourage every artist and creator to give it a try – having your own online shop can be an expensive process, and Etsy is perfect alternative for small businesses and those starting out. It can be daunting to see established brands with their professional pictures and endless reviews, but play to your strengths! You’re a small business, and you have the time to go the extra mile – put personality into your descriptions, make your packages look as beautiful as the product within, send a hand-written note to your customer and keep in touch throughout the order process. I may not have thousands of customers on Etsy, but I have communicated one-to-one with each person and made sure they don’t forget me or my business. You may be small, but you’re definitely powerful! Myro, I really appreciate the time that you took to answer my questions and share some business insights. Is there anything extra that you’d like to add before we finish up? Thank you for the opportunity to share! 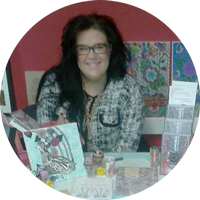 I would just say to anyone who has ever gone past a shop or a stall and thought ‘I can do that!’, the time to try is now – there has never been a better time to throw caution to the wind and try to make your dreams come true. Create a few things every week, start a Facebook page or a Twitter account, have a go at selling a few of your pieces on Etsy, enquire about local events you could be a part of – worst case scenario, your hobby stays your hobby which is no bad thing. Best case scenario? The world is your beautiful, hand made oyster! Myro is giving away a fabulous prize to all of our readers. She has kindly donated 2 cards and one notebook for the lucky winner to take home. If you’re interested in winning, just enter using raffle-copter below. 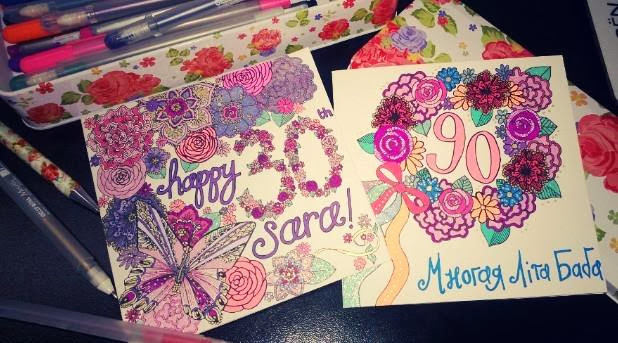 Myroslava Kochan of Myro Doodles is a twenty something professional card doodler who enjoys bringing Ukranian culture and her passion for mendhi together to create wonderful illustrations. 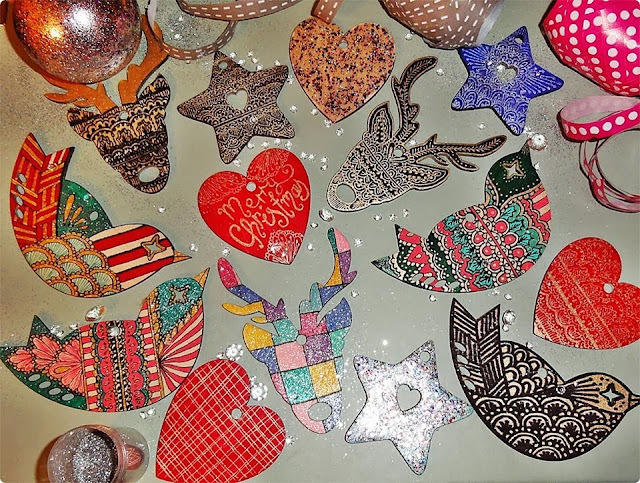 Myro has a brilliant etsy shop where she sells everything from greeting cards to Christmas decorations to notebooks. Next Next post: Gratitude Wednesday Part 3: How Can Gratitude Help You?